Marcus is a master of changing culture. Every healthcare institution needs to hear his message. Marcus is awesome on every level. His message resonated deeply with our emergency nurses and we are still applying his concepts. Our leaders rated Marcus’ presentation a 4.95 out of 5.0! Marcus was ‘phenomenal’, ‘hit the nail on the head’ and ‘so inspiring’ - just to quote a few members of our 1,000-person leadership audience. Not only did he deliver an incredible message through his story, but Marcus did an amazing job at intertwining the theme of our event throughout his presentation. Thank you, Marcus, for making this our best event yet! We had the privilege of bringing Marcus to our facilities two times in the last three years. His presentations are highly rated by our staff and we look forward to having him back in the near future! Marcus recently spoke to our group of over 300 healthcare leaders, and I can honestly say that he was the perfect choice for our meeting. Marcus was able to create a deep connection with all of the attendees through his expert storytelling, use of humor in just the right places, and sharing his deeply personal experiences in a way that moved everyone. Everyone walked away informed, motivated and empowered be part of the I’m Here Movement. Without a doubt, Marcus is one of the best speakers in the area of healthcare that I have ever heard. I recommend him to anyone looking for a speaker who can inspire new healthcare professionals, seasoned health professionals, or anyone facing adversity (and that would be all of us!). Marcus’ keynote is the most profound and inspiring healthcare presentation I have ever witnessed. He gave us practical tools and tactics that we can use every day to advance the patient experience. Marcus is a master story-teller who drives to the core why we entered the healthcare profession in the first place – to improve the lives of the patients and families we serve through healing and meaningful connections. Your staff will remember his message for a lifetime. The audience listened intently to Marcus’ brave, honest and powerful words. He didn’t just hold our attention. 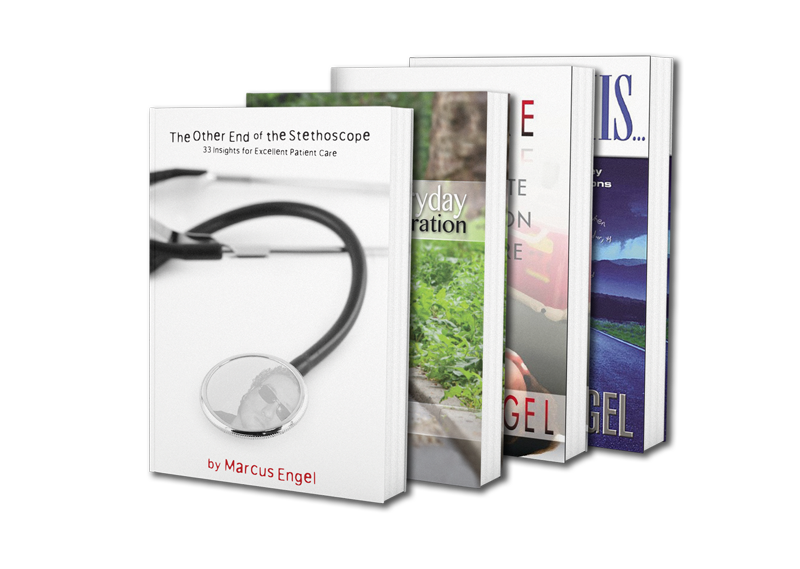 He made us grateful that we could get to know the person at the other end of the stethoscope. Healthcare is tough. Really tough. Of course, healthcare professionals always want to provide top notch service; but bureaucracy, policies, time pressures and the physical, emotional and spiritual demands of the job can leave employees feeling empty. Marcus gets it. The demands are high – and the stakes are higher. It can make the best care giver wonder if it’s worth it. How do we provide excellent care when compassion fatigue creeps in? How do we survive the rigors of healthcare without losing humanity? This is exactly what Marcus brings to the table. With the personal and academic background of an expert, an understanding of the REAL humor of healthcare and the heart of a storyteller that leaves an audience reaching for tissues, Marcus ties it all into an absolutely unforgettable presentation. Audiences are inspired, engaged and reminded of their “why” in this sacred work. Marcus’ experience as a survivor of massive trauma, author, academic background and engaging teaching style, uniquely combine to make him one of the nation’s premier healthcare thought leaders. Work overload. Constantly changing policies. Increasing bureaucratic regulations. These are just a few of the obstacles health care providers face every day — challenges that limit the ability to provide excellent patient care. Marcus’ insights will give health care providers new and essential strategies to rediscover the magic and compassion between caregiver and patient.